Progressive presses are designed for experienced reloaders, and shooters who go through several hundred rounds per week. Unlike a single stage loader, a progressive press causes many things to occur at the same time and because of this, there are many more things to monitor. There is no reason you can't start with a progressive press, but unless you go through over 500 rounds per week, a progressive press is not really necessary. 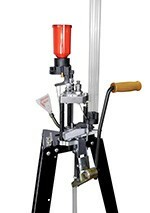 The Turret press is both less expensive and easier to set up, and (once set up) will reload up to 250 rounds an hour in experienced hands. Setting up a progressive press requires patience and attention to detail. The Anniversary kit contains the basic elements for a complete set up. Just order the die set(s) that correspond to the cartridges you wish to reload, and for rifle cartridges, a case length gauge to maintain correct case length. The shell holder needed for the press to use the dies is included with all Lee Die sets other than RGB. Designed for handgun calibers, and some small rifle calibers. Add a bullet and pull the lever; all other operations are automatic. One loaded cartridge with each pull of the lever. Every operation is automatic. Primers, like the powder, are fed only if a case is present. No wasted primers or spilled powder. Makes learning easy for the first time user and great for fine adjustments or experimenting. You can start reloading good ammunition minutes after the press is bolted down. All the features of the Pro 1000, designed for those that reload over 500 rounds per week and rifle calibers. A massive press with advanced features. Ram is 1 3/4" in diameter. Stroke and clearance sufficient for the largest magnum rifle cases. Load rifle and pistol rounds with equal ease. Five stations so you can factory crimp and post size. Every part of this tool was designed to be strong, long lasting, rust-resistant and user friendly. This machine is designed for a life-time of the hardest use.